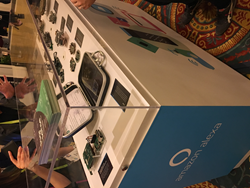 Sugr Tech joins Amazon at CES 2018 to present Sugr Sense latest solutions, including solution for wearable devices and the world’s 1st Amazon Alexa enabled 4G/LTE solution that uses roaming data for an endless number of true go-anywhere mobile applications. Amazon envisions a world where Alexa will be everywhere – at home, work, and on the go. As the world of computing evolves from touchscreen control to convenient voice commands, their open-source ecosystem is putting the power of Alexa into everything from speakers to smart home components to appliances. As more and more products join the Alexa family, the number of Alexa Skills has grown from 1,000 to over 7,000 in just the last year and the outlook for digital assistant products is excellent, with estimates for the market to reach $3.6 billion by 2020. For ODM/OEM brands that wish to quickly integrate the powerful Alexa system into their products, Sugr Technology, a global innovator in Amazon Alexa Voice Service (AVS) integration, makes it possible. Their patented Amazon certified turnkey solutions make Alexa integration easy. Sugr’s AVS-ready modules accelerate prototyping and manufacturing of connected devices integrated with Alexa so that brands can enter the lucrative voice control market quickly and easily. Sugr Sense solutions provide everything that is needed for seamless integration of Alexa: a chip-on-board main module with operating system, software for applications, and ready-to-integrate iOS and Android SDKs for app controls. Sugr Sense A1 – A four microphone array on Amlogic platform with patented voice signal processing that provides a full-stack hardware and software solution for 3rd-party devices. Sugr Sense AL – The world’s 1st 4G/LTE Amazon Alexa enabled solution that uses roaming data for an endless number of true go-anywhere mobile applications. Sugr Sense W – A full stack software and hardware solution including iOS/Android apps for Amazon Alexa Mobile Accessory Kit, supporting headsets, earbuds, and other wearable devices and hands-free applications. In addition to a product and service showcase, Sugr team members will be on hand to discuss how developers and device makers can build next generation voice-powered devices for home, auto and mobile using cloud-based conversational AI systems from Amazon as well as innovative overseas provider, Tencent. With the full-stack Sugr Sense solution including IP, software and hardware, along with testing tools and mass manufacturing optimizations, OEM/ODM brands can achieve Alexa integrations, Amazon certification and production ready prototypes in as little as 2 months. Sugr Technology, a global innovator in sound technology and High Definition Wi-Fi Audio systems, is based in Shenzhen (China), with additional offices in the USA and Oslo, Norway. Sugr provides the full-stack hardware and software solution - Sugr Sense™, which is certified by Amazon AVS. Sugr has an experienced team, with members from Microsoft, Cisco, Harman, Huawei, and Foxconn. The group is leading innovation on software voice processing & audio post processing technologies as well as user interactive design, acoustic design and system integration. Sugr has patented sound algorithms including: Acoustic Echo Cancellation, Dynamic Range Control, Noise Reduction, Sound Source Detection, Programmable Equalizer, Bass Enhancement, and more. All these algorithms are optimized and included with Sugr Sense ™ modules.